The AMX 30 B is a French tier 10 medium tank. Developed in 1966. The vehicle had maneuverability, engine power, and effective anti-tank engagement distance superior to all other vehicles except the Leopard 1. Great view range allowed the vehicle’s commander to coordinate the actions of the crew and to maintain situational awareness, greatly increasing the vehicle’s effectiveness. The armor of the vehicle was quite thin, but it was decided that technological advances in anti-tank shells had essentially rendered armor obsolete: survivability would depend on mobility and firepower. A total of 2,800 vehicles were manufactured. The AMX 30 B marks the end of its French medium line. 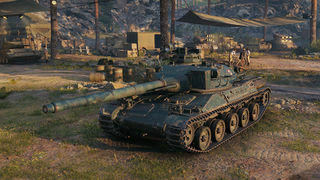 Playing with AMX 30B is very similar to the tier 9 AMX. 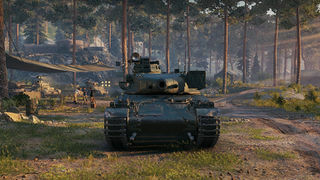 You have to make use of your gun depression, good mobility, excellent disperse while turret rotating makes you snap the shots into your enemies. Due to the low penetration value you have to flank sometimes or choose your position right. Maybe its a bit hard to play with it since players dont have much time to practice on lower tiers, but if you have for example the line of AMX 50B, than it wont be that hard. You have to keep distance, play a support role on the midline. Dont want to snipe, its not that accurate and dont have the penetration for good sniping action. Good luck. Comparative trials were nevertheless held at Mailly-le-Camp, Meppen, Bourges and Satory between five French and five German prototypes between August and October 1963, under Italian, Dutch, Belgian and American supervision. The French type had received a separate national designation: AMX 30. The trials indicated that the German type, on 1 October also getting its own name Leopard, had a better mobility and acceleration. The French government decided that it could not procure a new tank until 1965, while the Germans refused to adopt the Franco-German 105-millimeter (4.1 in) tank gun, in lieu of the British Royal Ordnance L7, of which they had already ordered 1,500 in the autumn of 1962 their plan having failed for Rheinmetall to produce in Germany a common type of munition of sufficient quality. Suggestions to save the project by combining the French turret with the German chassis failed. As a result, the program was cancelled and the French and Germans definitely decided to adopt their two separate tanks. One of the two 1965 pre-production vehicles. The prototypes of the AMX-30 weighed 32.5 metric tons (35.8 short tons), and were compact, with a width of 3.1 metres (10 ft), comparable only to the Swiss Panzer 61, and a height of 2.28 meters (7.5 ft), comparable only to the Soviet T-55. 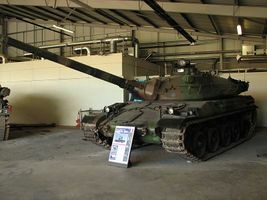 In contrast to the AMX 50, the AMX-30 was issued a conventional turret, because it was found that it was more difficult to seal oscillating turrets from radioactive dust and against water when the tank was submerged. Oscillating turrets also had a large ballistic weakness in the area of the skirt and turret ring. Originally, the first two prototypes were powered by a 720 horsepower (540 kW) spark ignition engine, named the SOFAM 12 GSds. Later, a multi-fuel diesel engine was adopted, developed by Hispano-Suiza. The seven 1963 prototypes of the AMX-30 were later rebuilt with the new diesel engine. Two further prototypes, meant to be direct preproduction vehicles, were delivered in November 1965. Besides the diesel engines, they had changed hull and turret casts and different gun mantlets; the latter would again be changed in the production vehicles. The first production versions of the AMX-30, named AMX 30B to distinguish them from the AMX 30A prototypes, were completed in June 1966, manufactured with a welded and cast hull and a fully cast turret. The production version of the tank had a combat weight of 36 metric tons (40 short tons). The AMX-30's survivability was based on its mobility; French engineers believed that the tank's mobility would have been compromised had they added enough steel plating to protect against modern anti-tank threats, including high explosive anti-tank warheads (HEAT). As a result, the type had the thinnest armour of any main battle tank produced at the time. The turret has a maximum armour thickness of 50 millimetres (2.0 in), the armour sloped at 70 degrees on the front plate and 23 degrees on the side, offering protection against 20-millimetre (0.79 in) armour piercing projectiles. The Line-of-Sight armour values are: 79-millimeter (3.1 in) for the front of the hull; 59-millimetre (2.3 in) for the forward sides of the hull; 30-millimetre (1.2 in) for the rear sides and rear of the hull; 15-millimetre (0.59 in) for the hull top and bottom; 80.8-millimeter (3.18 in) for the turret front; 41.5-millimeter (1.63 in) for the turret sides; 50-millimetre (2.0 in) for the turret rear and 20-millimetre (0.79 in) for the turret top. Further protection is offered by a nuclear, biological and chemical protection suit, including a ventilation system. 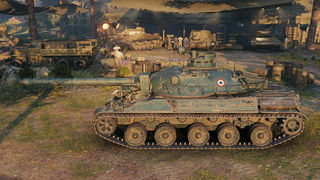 One of the unique features of the AMX-30 was the Obus à Charge Creuse de 105 mm Modèle F1 (Obus G) HEAT projectile and its main gun, the Modèle F1, a monoblock steel 105-millimeter (4.1 in) cannon. HEAT warheads suffer when spin stabilized, a product of rifled barrels, causing the French to develop the Obus G, (Gresse). This projectile was composed of two major parts, including the outer shell and a suspended inner shell, divided by ball bearings. This allowed the projectile to be spin-stabilized, and therefore more accurate than a normal fin-stabilized HEAT-round, while the inner shell did not move, allowing the warhead to work at maximum efficiency. The warhead, containing 780 gram hexolite, could penetrate up to 400 millimeters (16 in) of steel armour and was effective against tanks at up to 3,000 meters (3,300 yd). As it combined a good accuracy with a penetration that was independent of range, it has been considered an "ideal round" for its day The AMX-30 was also designed to fire the OCC F1 Mle.60 high explosive projectile, the SCC F1 training warhead and the OFUM PH-105 F1 smoke round. The main gun was coupled with a 380-millimeter (15 in) recoil brake, which had a maximum extension of 400 millimeters (16 in), and could depress to −8 degrees or elevate to 20 degrees. The turret's firepower was augmented by a coaxial 12.7-millimeter (0.50 in) M2 Browning machine gun. The tank commander also made use of a 7.62-millimeter (0.300 in) anti-aircraft machine gun on the turret roof. The vehicle carried 50 105-millimeter (4.1 in) projectiles, 748 12.7-millimeter (0.50 in) rounds and 2,050 7.62-millimeter (0.300 in) bullets. The tank commander was issued a cupola which offered ten all-around direct-vision episcopes, and a binocular telescope with 10x magnification. The commander was also given an optical full-field coincidence range finder. The gunner was given a telescoping gun sight and two observation periscopes. The production version of the AMX-30 was fitted with Hispano-Suiza's HS-110 diesel engine, located in the rear of the hull. The 28.8 liters (1,760 cu in) engine could be replaced on the field in 45 minutes, and produced 720 horsepower (540 kW), offering the tank a maximum velocity of 65 kilometers per hour (40 mph) on roads. The fuel efficient engine, in conjunction with a total fuel capacity of 970 liters (260 U.S. gal), gave the AMX-30 a maximum road range of up to 600 kilometers (370 mi). The engine's drive is taken through a Gravina G.H.B.200C twin-plate centrifugal clutch. The gearbox was an AMX 5-SD-200D, with five forward gears and five reverse gears. This transmission was heavily influenced by that of the German Panther tank and was based on a project which had begun in 1938. The transmission was one of the AMX-30's major faults and caused a variety of mechanical problems, including that the driver would have to manually change gears at specific times, even if the tank was moving over rough terrain. 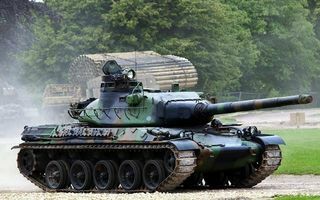 The tank's weight is distributed over five double, aluminum-alloy, rubber-tyred road wheels on either side, propelled on 570-millimeter (22 in) wide tracks. The tank could ford 1.3-meter (1.4 yd) deep water obstacles without preparation, up to 2 meters (2.2 yd) with minor preparation, and up to 4 meters (4.4 yd) with full preparation. Full preparation for water operations consisted of the addition of a snorkel tube, the installation of blanking plates, carried on the front of the hull, over the engine compartment's air intake louvers, and the installment of infra-red driving equipment, including a searchlight. In 1969 a single special dive training vehicle was adapted, nicknamed the AMX 30 Gloutte (from French faire glouglou, "gurgle"), without engine and tracks, that over a ramp could quickly be lowered into a reservoir by a winch; it was equipped with an escape tube. This page was last modified on 4 September 2018, at 18:49. This page has been accessed 72,969 times.